Dining set DAVID • JELÍNEK - výroba nábytku s.r.o. Do you wish to have a dining table that does not take a lot of space at home, and even your wider family is comfortable with it? Then you will be excited about the practical DAVID dining set, which features a unique folding table and anatomically shaped dining chairs. The timeless design of the DAVID dining set fits perfectly into every interior while at home. The DAVID sofa table is oval in shape, making it perfectly suited as a regular dining table for 4-6 people. However, the DAVID table can be stretched up to a length of 310 cm and can accommodate up to 12 people at this long table! The DAVID table is therefore ideal for more frequent visits by relatives or friends, and you will be left out of trouble to settle your guests. When the visit leaves, you simply have to fold down the table again and it will be able to function normally without the long table in the room hindering you. The DAVID dining table is made of solid beech wood. The table top is made of veneer and the bent parts of the furniture are made of laminated bent beech. The color of the table picking can be chosen by the customer from the basic sampler. Individual shades can also be customized to individual customer requirements. 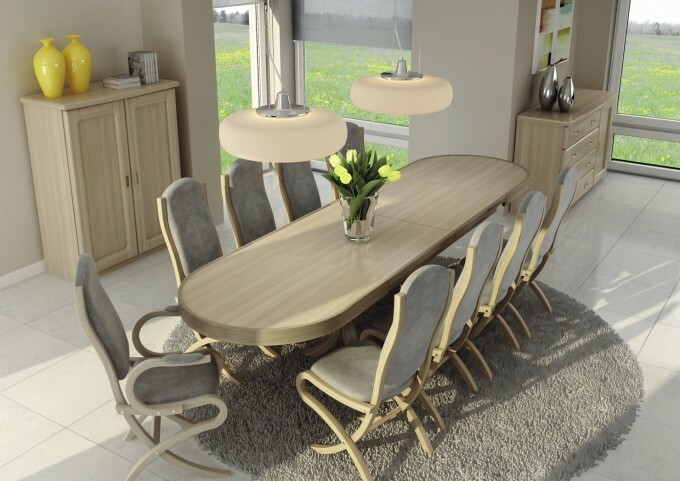 DAVID’s dining set includes anatomically shaped ABRA EXTRA dining chairs to give your backs the right support. This makes your chair not only provide a healthy sitting but also has a good overall effect on your locomotory system. The ABRA EXTRA dining chair is designed to eliminate unwanted spinal deformities while reducing the fatigue of your locomotory system. Its timeless design and elegant lines will surely delight you! ABRA EXTRA dining chairs can be ordered either with or without armrests. The armchair chair is more ceremonial and makes it easier to get up from the table. A chairs without armrests are more suited to airy and open spaces. It’s up to you to decide which variation you choose. ABRA EXTRA chairs can be selected from a wide selection of JELÍNEK swatches.